Waxelene manufacturers innovative organic skincare products. Todd Cooper, CEO of Waxelene, came to Agency73 in need of an updated look and feel to his site along with pulling his separate web offerings together into a single site. His home page and informational pages, Direct-to-Consumer shop, and Wholesale shop were on three different websites. Agency73 began with an overhaul of Waxelene’s package design for its current products as well as several new products that were preparing to go into production. Once those were done, our designers carried that look and feel over to redesigning Waxelene’s new website. The focus of the site redesign was to modernize the graphics, transitions, menus, navigation, and color schemes, while keeping the site architecture with information including explanatory videos, reviews, testimonials, and more that Waxelene had spent years building. Agency73 worked with Waxelene to identify functionality upgrades that would make the Waxelene team’s work easier and more efficient and worked with to implement those in the most cost-effective, efficient, and user-friendly way possible. 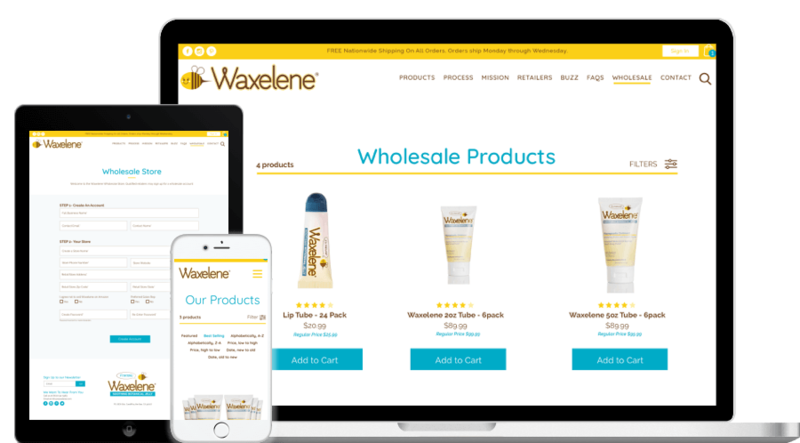 Waxelene needed a simple solution to allow them to manage their wholesale business through their Shopify store. They’d been using two separate Shopify stores to keep their wholesale business and D2C business separate. Agency73 was able to streamline this solution for Waxelene by building a custom Shopify app to implement a solution allowing them to keep both channels selling in a single store. This lessened the administrative burden on Waxelene and their distribution partners allowing them to retain a lean operational back end.